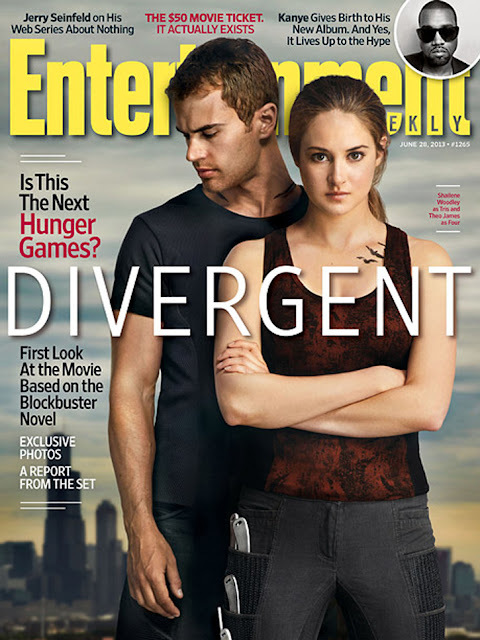 Earlier today, we were blown away when Entertainment Weekly revealed Divergent would be featuring in this week's magazine. We hadn't been expecting treats like this to come so soon as the movie is still filming, but we're very happy that they did! On the cover is our first still of Tris & Four together, and a hint of what is inside, a report from the set in Chicago and exclusive photos. The treats didn't end there. 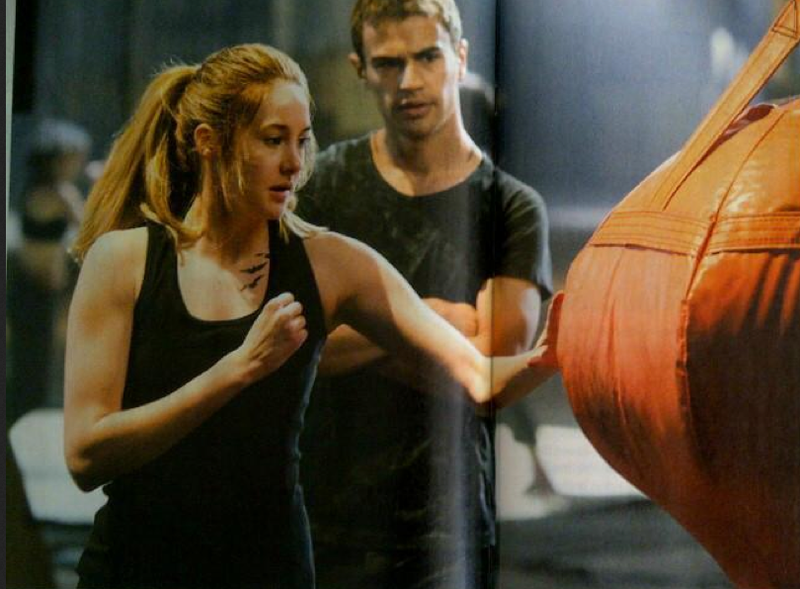 Christmas came early as scans of the new stills featured inside and an amazing behind the scenes video became available. 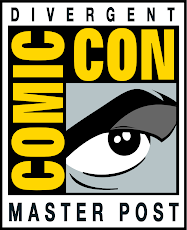 We've posted everything below, including a transcript, in one master post for you to check out. Pick up a copy of EW from newstands on Friday the 21st June, or buy online HERE. “Just so you know…Shai’s a hugger.” This is the word on the Divergent set, spoken sotto voce by three different people to a visiting journalist about “Shai,” better known as Shailene Woodley. Is it a promise? A threat? The actress, 21, is currently ascending the Hollywood ladder at a blistering pace. She’ll play Mary Jane in the Amazing Spiderman franchise and has the buzzy Sundance favorite The Spectacular Now in theatres in August- the same month she’ll begin work as the star of the highly anticipated adaptation of John Green’s bestseller The Fault in Our Stars. 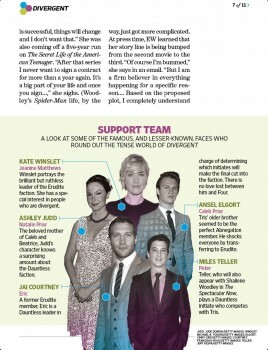 Bit its Divergent, shooting in a chilly Chicago, that rests most heavily on Woodley’s narrow shoulders. 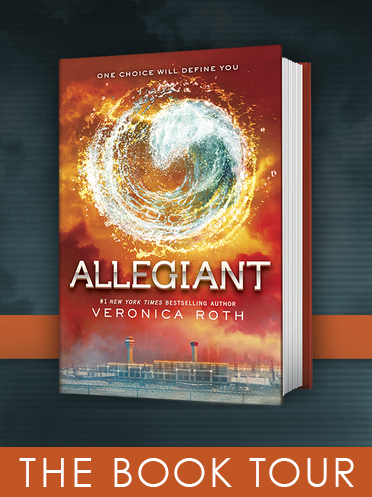 Directed by Neil Burger (Limitless) and adapted from the bestselling YA series by Veronica Roth, it’s the launch of a franchise that could rival The Hunger Games and Twilight. It certainly has the requisite elements: Grim dystopian future? Check. Spirited heroine charged with saving the world? Double check. 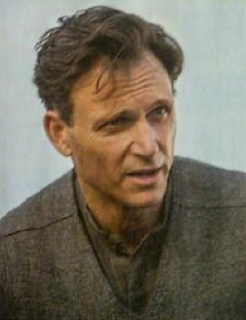 A hunky yet complicated love interest? Duh, of course: His name is Four and he’s played by Theo James (famous for dying in Lady Mary’s bed in season 1 of Downton Abbey). Oh, and it even has an Oscar winner in a supporting role for good measure: Kate Winslet as an Erudite official who craves power. Despite the cold winds, the cast is clear eyed, ruddy cheeked, and as playful as a pack of puppies on this evening in late April. Woodley talks easily and earnestly about taking a survivalist course (making fire, finding water, building shelter) as she does about her time with George Clooney on the set of 2011’s The Descendants. She sings in between takes. When she says she feels blessed and lucky, you actually believe her. And as predicted, she does hug you upon introduction- quite warmly in fact. The sun is setting and the temperature is dropping at Navy Pier along the shores of Lake Michigan. For those unfamiliar with Divergent, the novel takes place in a future where society is divided into five factions devoted to particular virtues: Abnegation (the selfless), Erudite (the intelligent), Candor (the honest), Amity (the peaceful), and Dauntless (the brave). When children reach the age of 16, they take a test to determine where their natural aptitudes place them. 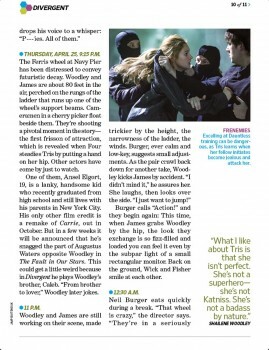 Our heroine, Beatrice “Tris” Prior, discovers she’s “divergent”- an extraordinary result meaning she’s suited to more than one faction. 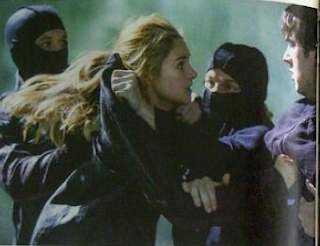 Tris leaves her Abnegation family behind and chooses Dauntless. 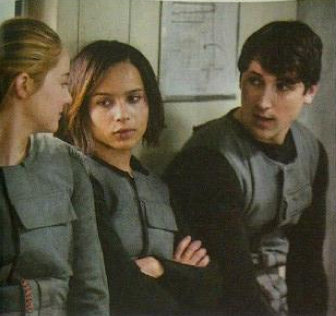 Much of this first installment deals with grueling physical and psychological trials for initiates, including tonight’s scene, which is the Divergent version of capture the flag. Without giving away too much of the twisty plot, lets just say that being divergent puts Tris in danger and right at the center of serious government unrest. 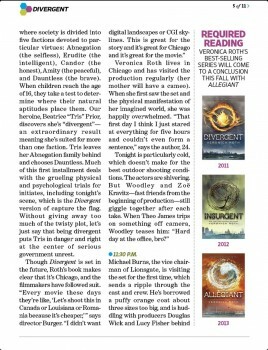 Veronica Roth lives in Chicago and has visited the production regularly (her mother will have a cameo). When she first saw the set and physical manifestation of her imagined world, she was happily overwhelmed. “ That first day I think I just stared at everything for five hours and couldn’t even form a sentence,” says the author, 24. It continues to get colder. Jai Courtney, who plays a Dauntless instructor, swings by to say hello. He greets Wick with a hug and watches Woodley on the monitor. “She’s going to be such a big f---ing star,” he says quietly. The Ferris wheel at Navy Pier has been distressed to convey futuristic decay. Woodley and James are about 80 feet in the air, perched on the rungs of the ladder than runs up one of the wheels support beams. Cameramen in a cherry picker float beside them. 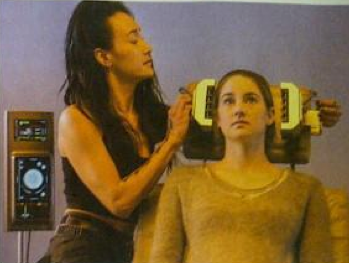 They’re shooting a pivotal moment in the story- the first frisson of attraction, which is revealed when Four steadies Tris by putting a hand on her hip. Other actors have come by just to watch. 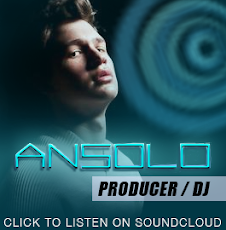 One of them, Ansel Elgort, 19, is a lanky, handsome kid who recently graduated from high school and still lives with his parents in New York City. His only other film credit is Carrie, out in October. But in a few weeks it will be announced that he’s snagged the part of Augustus Walters opposite Woodley in The Fault in Our Stars. 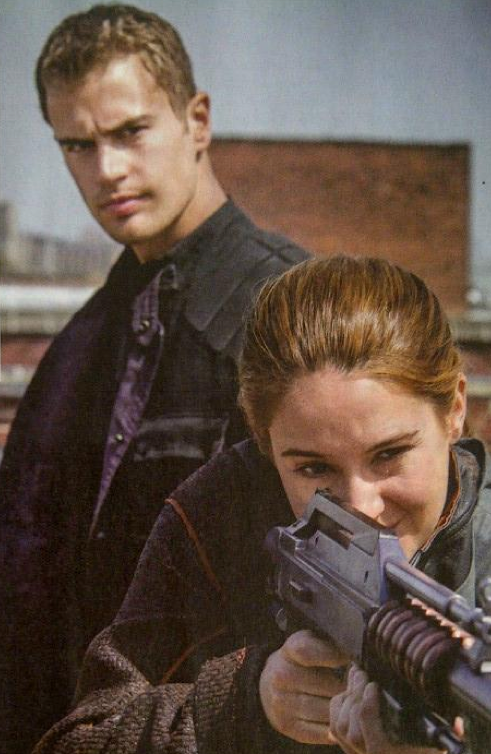 This could get a little weird because in Divergent he plays Woodley’s brother, Caleb. “From brother to lover,” Woodley later jokes. Burger calls “Action!” and they begin again: This time, when James grabs Woodley by the hip, the look they exchange is so fizz-filled and loaded you can feel it even by the subpar light of a small rectangular monitor. Back on the ground, Wick and Fisher smile at each other.